Symmetry Series 360 offers sleek protection for iPad Pro (11-inch) and iPad Pro (12.9-inch) (3rd Gen). "iPads are computing and entertainment powerhouses, making them integral to an on-the-go life," OtterBox CEO Jim Parke said. "Symmetry Series 360 safeguards iPad Pro (11-inch) and iPad Pro (12.9-inch) (3rd Gen) in a thin, protective case so you can take it wherever you go." Symmetry Series 360 offers sleek protection for iPad Pro (11-inch) and iPad Pro (12.9-inch) (3rd Gen). The slim design makes it the perfect case for home, the commute, the office and back again. 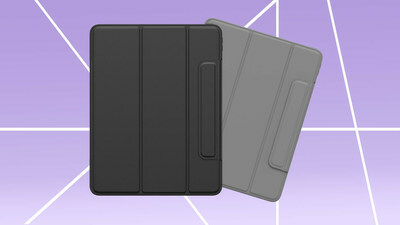 A folio folds over the display to keep it free of scuffs and scratches on the go and can be folded into a stand during use, while the clear case back and black or grey bumper shows off the refined curves of each iPad. Symmetry Series 360 is the only OtterBox case currently available for iPad Pro (11-inch) and iPad Pro (12.9-inch) (3rd Gen.), starting at $79.95 in Apple stores or on apple.com. Symmetry Series 360 and Defender Series for the new iPad Pro devices are coming soon to otterbox.com. 1 Symmetry Series 360 are NOT protective against water. Will provide added protection against drops and shock.